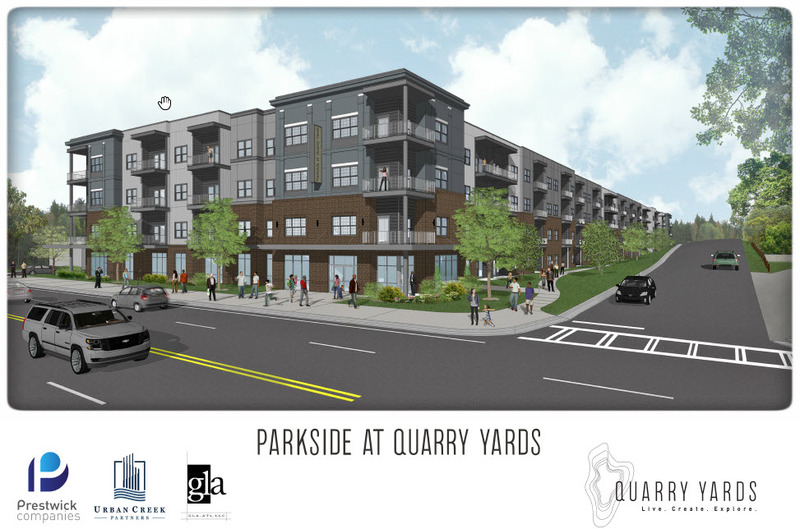 Atlanta – September 27, 2018 – Urban Creek Partners and Prestwick Development Company LLC have entered into a joint venture agreement to develop Parkside at Quarry Yards, a 177-unit quality workforce and affordable housing community that will break ground second quarter 2019 as part of Quarry Yards’ first phase. To see a rendering of the project, click here. Parkside at Quarry Yards will showcase a modern exterior and include one-, two- and three-bedroom units in two buildings. Approximately 15 percent of the units will be available to local workforce earning 80 percent of the area median income (AMI), while 85 percent of the units will target residents earning 50 percent to 60 percent AMI. Amenities will include a community room with a warming kitchen, a state-of-the-art fitness center, a business center with computer stations and a laundry room. Outdoor amenities include a gazebo and picnic area, community gardens, a playground and green space. “We’ve been working with and listening to the community’s residents for the past 10 years. We understand what they want in Quarry Yards and feel that this first project in the development will help meet the growing needs for affordable and attainable housing on the Westside. We are proud to partner with Prestwick Development with their deep set of skills and experience on quality workforce housing developments,” said Mark Teixeira, co-founder and principal – Urban Creek Partners. Parkside at Quarry Yards, located at 1314 Donald Lee Hollowell Parkway, will have unprecedented access to the Bankhead MARTA station, Proctor Creek Greenway Trail and eventually Westside Park at Bellwood Quarry as well as the Atlanta BeltLine’s Westside Trail. “Prestwick Companies, through our partnership with Urban Creek Partners, is thrilled to be developing Parkside at Quarry Yards. Affordable housing is needed more than ever in Atlanta and this community will help 177 low income families live in an irreplaceable location next to MARTA rail, the Atlanta BeltLine and the City’s largest park – Westside Park at Bellwood Quarry,” said Jody Tucker, CEO – Prestwick Companies. To register for more information about Parkside at Quarry Yards, people should visit quarryyards.com and register for the newsletter, and follow Quarry Yards on Facebook and Twitter. Prestwick Development Company, LLC is an Atlanta-based multifamily developer that focuses on affordable/workforce and market rate housing in the Southeast. Prestwick Companies has completed over 30 affordable housing communities since 2008. The Prestwick Team understands how New Urbanist Principals are revolutionizing not only the developments they work on, but the way people live in the finished product. For more information, visit prestwickcompanies.com.